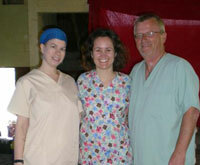 In March 2012, Dr. Rachel participated on her fourth dental mission trip with the organization Dentistry For All (dentistryforall.org), performing general dentistry to the underserved citizens of Guatemala. 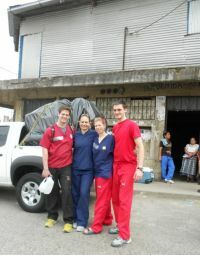 This year, Dr. Rachel along with three University of Louisville School of Dentistry (ULSD) students returned to Guatemala City, Guatemala from March 17-25, 2012. The group pictured is student doctor Jared ’15, student doctor Allie ’13, Dr. Rachel and student doctore McKinley ’15. With the help of 4 large hockey bags, Dr. Rachel and her students packed and carried all the donated supplies by hand to their make-shift clinic in Santa Isabel, Guatemala City. This laborious affair took strategic planning due to weight restrictions by the airlines and careful thought through customs once in Guatemala. The work week consisted of three general dentists, one pediatric dentist, one oral surgeon, two hygienists and three dental students (ULSD) with an assisting team comprised of ten non-dentists and 4 student translators from the local University! During this week, the group saw a total of 214 patients; 44 men, 92 women, 28 boys and 50 girls. The group performed over 637 procedures consisting of 49 silver fillings, 226 white fillings, 191 extractions, 123 cleanings and 48 other procedures (i.e. root canals, sealants)! A volunteer from this year’s trip made a video about his week in Guatemala (a different week than Dr. Rachel’s week). Turn on the volume and watch this video by clicking here. For more information about Dentistry For All and details about this and other upcoming trips, please visit their website http://www.dentistryforall.org. The group is always looking for volunteers. Dr. Rachel and her staff, Diane, Taylor and Stephanie, volunteered for the 10th anniversary of Smile Kentucky, Give Kids A Smile Day, at the University of Louisville School of Dentistry. This year the team worked at the newly renovated dental school and saw four students (ages 10-12) with urgent dental needs. The team worked from 8am until 1pm treating these kids with exams, x-rays, cleanings, fillings and extractions. Two of the patients had never been to the dentist before. Dr. Rachel was featured in two publications: the Courier Journal and the American Dental Association. Below are the links, watch the video on the Courier Journal website; see what Destiny Butler has to say about her first dental visit with us! Dr. Rachel, Diane (assistant) and Jennifer (hygienist) were invited to the office of Drs. 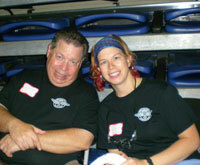 Dennis Price and Carmel Gleis for Smile Kentucky this year. Every year this event is held at the University of Louisville School of Dentistry, but because of the construction on the almost finished renovated school there was limited space for the project. 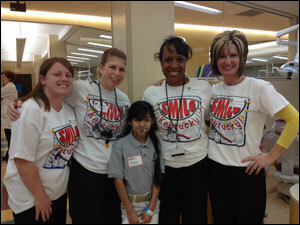 So Smile Kentucky was coordinated "off-campus" this year at seven local dental offices. Dr. Rachel, Diane and Jennifer arrived at 9am on Friday February 4 and worked straight through until 2:30pm seeing over seven 4th and 5th graders from Henry County. Many of these students had never been to the dentist before and need extensive care. Free dental care was given to each child, including cleaning, exam, x-rays, fluoride and restorative work (including white and silver fillings, sealants and root canals and crowns on baby teeth). It was a rewarding experience participating in this event again this year; from the screenings done in October to the actual treatment day in February, Smile Kentucky is an amazing opportunity to give back to our community! This past February, Dr. Rachel embarked on her third mission trip to Guatemala to volunteer her dental skills to the people of Comitancillo (Comi) with the Canadian based group Dentistry For All. She got involved with Dentistry For All through her dental fraternity, Alpha Omega, and has since gone each year. 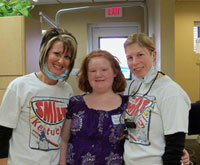 She enjoys participating in this project and giving back to those less fortunate in the form of dentistry. 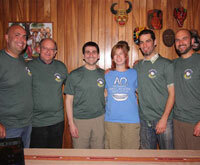 Pictured are Alpha Omegans during week 2 and 3 in Guatemala (R to L): Dr. Shane Fisher, Dr. Alan Ross, Dr. Mark Berkman, Dr. Rachel Davis, Dr. Richard Halpern and Dr. Brad Krusky. Although this was Dr. Rachel's third mission, it was her second time visiting Comi and she was excited to return to the impoverished town where most of the families struggle on only a few dollars a day to survive. She was on the second of five weeks to make the trek down south to Central America. 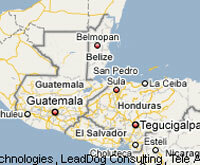 One of the group leaders was living in Guatemala for 6 months trying to help erect a permanent clinic in Comi. The week Dr. Rachel was in Comi, the group leader was negotiating land plots and buildings, and arranging for Dentistry For All's future permanent clinic space.This year Dr. Rachel was very fortunate to again receive donations from her dental suppliers. Without the help of such great companies and their generous donations, she could not have done such great work on the deserving community of Comi. In the past, Dr. Rachel's passion for Guatemala has been to treat the patients that need root canals to save front teeth. This past year, Tulsa Dentsply donated three endodontic motors and even more root canal supplies! Dr. Rachel has since made an endodontic tub for all the endodontic supplies so that any volunteer dentist that feels comfortable doing a root canal on the trip can help a patient maintain their teeth. The vision for Dentistry For All over the next few years, is to acquire more dentist and volunteers to staff a year-round dental clinic in Comi and to establish a working relationship with the citizens throughout Guatemala. One thing is for sure, once you have been to Guatemala and have experienced the culture and graciousness of the community, you will be become a regular on the Dentistry For All team and this is a healthy addiction. If you are interested in volunteering or donating, please contact Dr. Rachel or check out the Dentistry For All website. You can also purchase beautiful artisan works from the people of Comi. 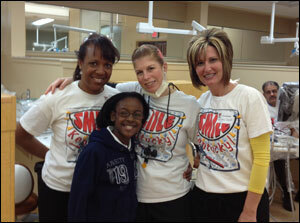 Dr. Rachel and her staff volunteered at Smile Kentucky for the fifth year in a row. 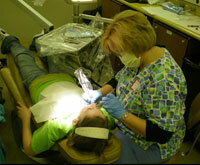 The staff participated in the dental screenings in the fall and the free dental procedures three months later at the University of Louisville School of Dentistry. This year, Dr. Rachel and her two assistants, Taylor and Diane, ventured to Brandeis Elementary to screen over 100 children in anticipation for the February 5 treatment day. They were met by the Metro Van at the school and spent over 3 hours screening second, third, fourth and fifth graders to determine who met the criteria for participation in the free dental work at the school. Dr. Rachel stated, “I’m surprised by the overall increase of children with less decay this year than in previous years. The work we are doing is paying off and we can now see our efforts are working by the clean and healthy mouths we are screening." On Friday, February 5, 2010, Dr. Rachel brought her staff consisting of her hygienist, Carol and two assistants, Diane and Shayna. The day started early with 6 children to be seen within a four hour block. Half of the children that received worked had never been to the dentist before and received their first cleanings with fluoride treatment, fillings and protective sealants to prevent further decay. At the end of the day, the team was exhausted but their spirits were high by seeing all the smiling children they helped and changed their lives for the better. The Davis Dental Center Travels to Eastern Kentucky to Volunteer for R.A.M. Drs. Leslie and Rachel Davis, along with assistants Taylor, Ashley and Becca and hygienist Carol, travelled 4 hours to Pikeville County to participate in the Remote Area Medical (R.A.M.) clinic by volunteering their time and skills to help with the dental needs for the people of Eastern Kentucky. The program took place on June 27 and 28 in Pikeville County at the local high school. The Davis Dental Center joined the University of Louisville School of Dentistry group and worked both days and stayed late in order to give back to the community. The Remote Area Medical® (RAM) Volunteer Corps is a non-profit, volunteer, airborne relief corps dedicated to serving mankind by providing free health care, dental care, eye care, veterinary services, and technical and educational assistance to people in remote areas of the United States and the world. Dr. Rachel, Taylor and Ashley provided dental services throughout the day and performed many restorative procedures such as white and silver fillings. Dr. Leslie Davis was one of two dentists who exclusively worked on removable appliances (i.e. dentures and partials) performing much needed relines and repairs. Carol was very busy with her phenomenal cleanings and oral hygiene instructions. 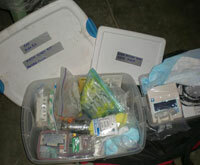 The weekend enriched the lives of both the patients and the volunteers. 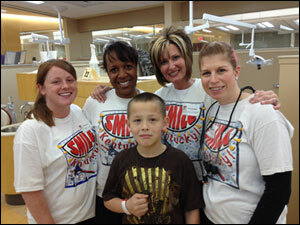 The Davis Dental Center plans to participate again at the next RAM event. Please go to RAM's Website to learn more about RAM and how to get involved with our community. Thank you so much to everyone that made this trip a success! 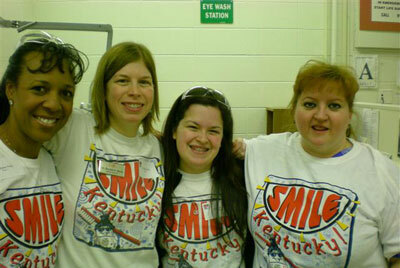 On February 6, 2009, Dr. Rachel, Stephanie (hygienist), Ashley and Erin (dental assistants) volunteered all day at the University of Louisville School of Dentistry for the nationwide Give Kids a Smile Day, AKA Smile KY! Over 300 children from Jefferson and surrounding counties were bused down to the School of Dentistry to have free dental work completed by volunteers just like the Davis Dental Center. 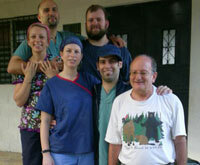 This team of four saw 10 patients, ranging is ages from 8-13 y.o. Every patient received a thorough cleaning and fluoride treatment, sealants were placed on all molars and multiple fillings were performed. "This is a great way to give back to the community," stated Dr. Rachel after completing the event. "We have been volunteering for Smile Ky for the past four years and can see the benefits it give to the kids and our community. We'll definitely be back next year!" University of Louisville School of Dentistry, Smile KY!